Just look at these wonderful offerings – crabapples we picked yesterday here in the Derwent Valley. 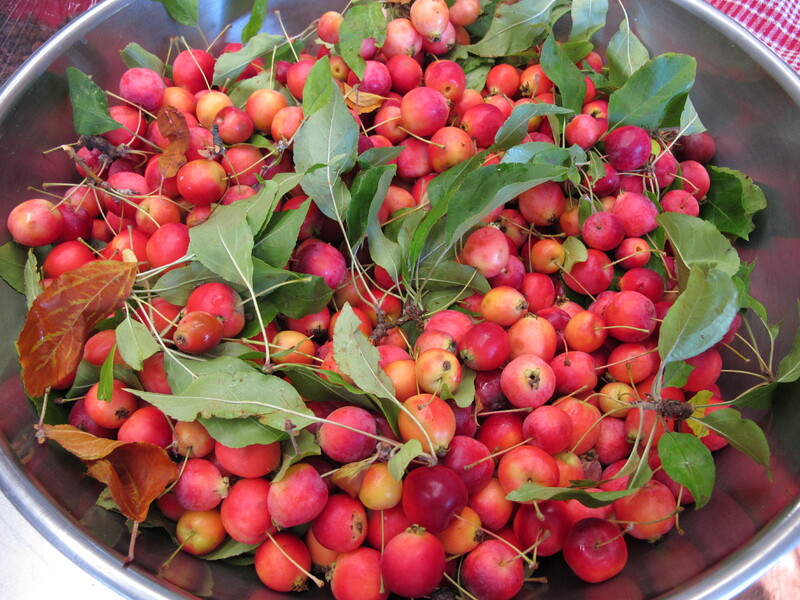 They’ll soon be turned into jelly, paste (to serve with cheese) and sparkling crabapple drink. Yum. Between these and an abundance of apples and quinces, it’s going to be a busy weekend here in the kitchen. purchased your “A Year on the Farm” and read it from cover to cover TWICE, with short breaks to cook anything that was no nailed down. The shelves are groaning with tomato chutney. I found myself bargaining on the side of the road for 17kg of jam cherries (perfect, just smaller) and after an assignation at a backwoods address, even more shelves are groaning with cherry chutney, cherry marinade, cherry jam. The only sad thing is my cherry and citrus sparking fruit drink after 14 days has grown a fascinating shape, twisting gracefully like an underwater creature. I love it, but not sure it is supposed to be there. A plant, as in ginger beer? We have bubbles, but I have anxiety. Hi Kerrie – so pleased everything is working for you, with the possible exception of the cherry and citrus sparkling fruit drink. Sounds like you have been REALLY busy. I suspect that strange creature is a vinegar ‘mother’ plant. Did you use organic apple cider vinegar by any chance? It would look like a kind of flat jelly fish by the way if it is indeed a vinegar plant. It may well be ok, but best to be safe so my motto is always – when in doubt, don’t, and surely I’d pass on drinking it, just in case. Let me know if you did use an organic vinegar. I believe I did use a half bottle of organic apple cider vinegar, topped up with white or red wine vinegar. It certainly does look like your word picture of a jellyfish. I will research more. Thanks so much.